In our family of 4, there are very few things that we all agree upon and that includes our taste in food. I finally found a dish or a sweet that we all like – Jalebi. My ‘soon-to-be’ 3 year old is not so fond of sweets but she instantly fell in love Jalebi or Jalbi (as she called it when we first introduced this new sweet to her). 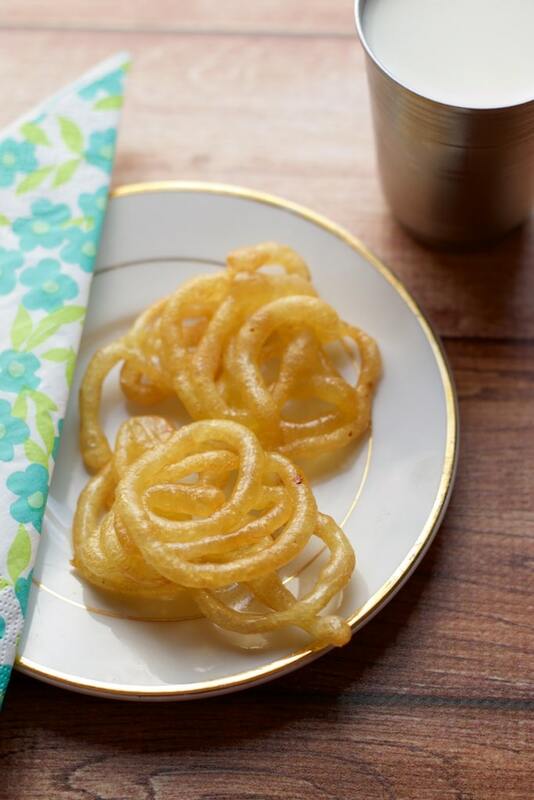 They are super easy to make and there are a few tricks & tips that I would like to share that would ensure that the Jalebis you make at home are exactly like you have had in your neighborhood mithaiwala (sweet vendor). Whisk the batter well after fermentation. It should be a thick batter which flows through easily. This one is obvious but if you want thin Jalebis, use a piping bag or a ketchup bottle with thin spout. One string consistency – The sugar syrup needs patience and time. Stir every couple of minutes for the first ten minutes and then put a drop of the sugar syrup on a plate. Place it between your thumb and index finger and when you pull them apart a single string is formed. Took me around 20 minutes to get to this stage. In a medium sized bowl, add all purpose flour, yeast mixture (if proofed separately), corn starch and mix well. Add yogurt, oil and water to this mixture and whisk them well till no lumps remain. Fermenting the batter - Take a larger bowl and fill it with warm water. Place the bowl with the batter inside this larger bowl. Cover the larger bowl with either a towel or a plate and set it aside for 30 minutes. Make the sugar syrup - On a gas stove, place a deep medium sized saucepan on medium heat, add sugar,water, and cardamom powder (if using) and bring this mixture to a boil. Reduce heat to medium low and continue to cook until one string consistency is achieved (please see tips above). Reduce heat to a simmer. Preheat oil for frying - Heat oil in a deep dish pan on medium-high heat. (Note: This oil will be used for deep frying the Jalebis so make sure you are using enough oil to completely immerse the jalebis). Making Jalebis - After 30 minutes, the batter should have fermented. Add the coloring if using. Whisk the batter well. The consistency of the batter should be thick but it should flow freely as well. Pour the batter in a piping bag. 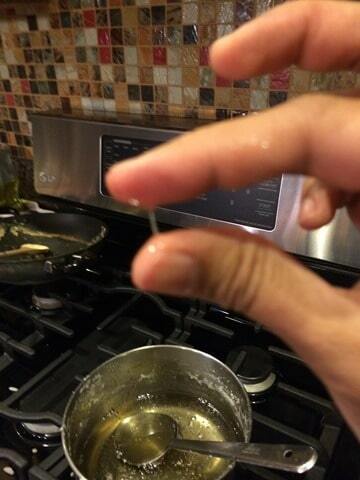 Use a smaller spout for thin jalebis. Squeeze the batter into the hot oil in circular motions. Fry for a minute or so till they turn golden and then flip the jalebis and cook the other side. Remove the jalebis using tongs making sure you shake off the excess oil and place them in the sugar syrup. Let them rest for a minute or so and then flip the jalebi and wait for another minute before transferring them into another plate. 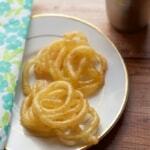 Make sure you shake the jalebi off before removing to shake off the excess sugar syrup. Repeat the process with the remaining jalebis.